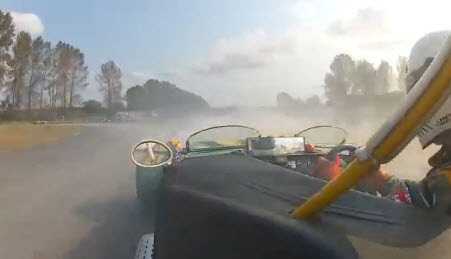 Vintage Racing Club of BC | Video – Dennis has a ‘Smokin’ Day’! Video – Dennis has a ‘Smokin’ Day’! 28 Sep Video – Dennis has a ‘Smokin’ Day’! The other stories described Dennis Repel’s very ‘interesting’ day at Mission during the Volunteer Memorial Weekend. In Race 1, he made lots of smoke (as in tire) while dealing with a sticking throttle in Turn 2. Then in Race 2, his Camaro made more smoke (as in goodbye engine!) when a rod let go on the overrun as he entered Turn 1. 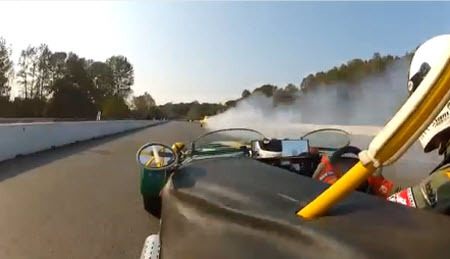 You can see it all from the best seat in the house – Mark Brown’s following Lotus Seven. Look for the video on the right (or just click here) to watch.